SPOILERS BELOW. Some images reveal weapons, locations, characters and other end game content. One of the first and strangest things players have found in Red Dead Redemption 2 is a UFO encounter in a small cabin in the woods. When I first saw a tweet about a UFO being found I thought it was either a lie or something subtle, like a shooting star that paranoid fans were misidentifying. Then I saw video evidence. Yup, that’s an actual UFO. The strange spaceship is found hovering over a small cabin at night. Inside you can find a ton of skeletons and a note referencing galaxy- and time-traveling visitors. Many assume the people who left the note were part of a cult that worshipped UFOs. After finding that first UFO, the community discovered a second UFO. This one can be spotted on top of a mountain in a different part of the map. It’s a different shape and color than the first UFO. Maybe a different species of alien? Some fans are already hoping for an alien invasion DLC, similar to the zombie DLC for the first game. Beyond UFOs, fans are also finding other evidence of aliens in RDR2. In some areas of the map, players have spotted strange drawings that seem to depict aliens, UFOs and other strange symbols. Fans also found a map that seems to be leading them towards the UFO mountain encounter, but the debate over what the map actually means is still ongoing. With so many places to explore, fans are still in the early days of solving this potential mystery. The Strange Man is character from one of Red Dead Redemption’s most memorable quest lines. He is a middle-aged or slightly older man who wears a nice suit and top hat. He gives main character John different missions that test his morality. He claims to know who John is, and by the end of the game it is seemingly revealed that he is immortal or at least unharmed by bullets. Players have theorized about the Strange Man since RDR was released in 2010, with many believing him to be God or the Devil, or maybe a demon. Well, The Strange Man appears in Red Dead Redemption 2. This time he is more hidden and trickier to find. Players first discovered a strange cabin that had an unfinished painting in it and had scribbled messages on the walls. Visiting the cabin as the story progresses revealed the painting was changing and gradually getting finished. 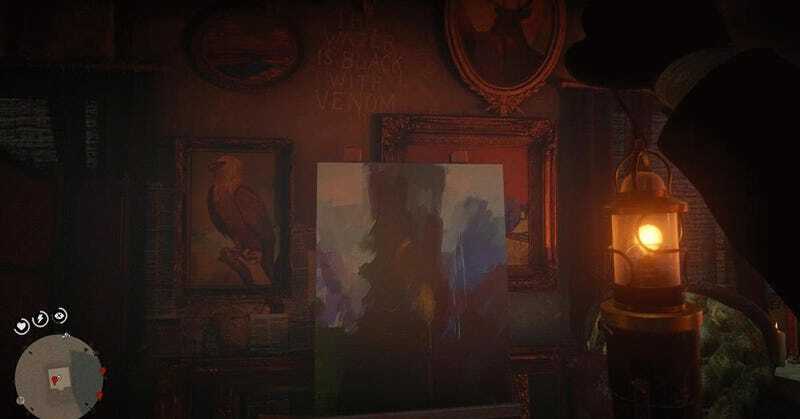 Eventually, after reaching 100% completion, players found the painting was a portrait of The Strange Man. Many players believe the cabin is directly connected to the mysterious figure, and players also found something very creepy inside. If you look at the mirror in the wooden cabin at the right angle you can see The Strange Man staring at you from behind. Turn around and he isn’t behind you. This seems to be more evidence that The Strange Man is supernatural. There is currently a popular theory about The Strange Man that revolves around him poisoning the water of Armadillo and cutting a deal with one of the local townsfolk. Again, we are still in the early days, so some or all of this information might be wrong or incomplete. But The Strange Man is already one of the creepier discoveries in RDR2. 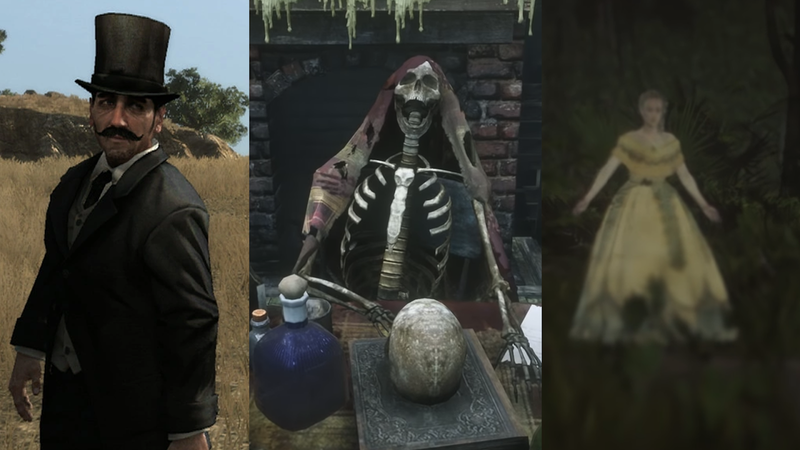 Deep in the swamps of Red Dead Redemption 2, players have found a ghostly woman who seems to haunt the area. She is the ghost of Agnes Dowd, a woman who seems to have at one time been a wealthy socialite. Her ghost now resides in the swaps of Lemoyne. Players can encounter her 16 times. Sometimes she can be seen, other times only heard. She isn’t the only ghost haunting the game. 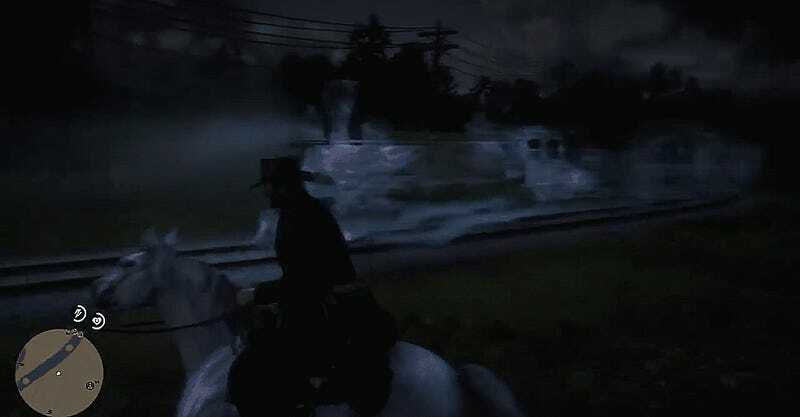 Also found near the swamps of Lemoyne is a ghostly train. The train appears only at night and will spook your horse when it gets close. You can’t really interact with it, so you probably can’t stop it. Another paranormal discovery was found in Blackwater. After solving a series of riddles located in the southerly city, players can find a man who is drinking the blood of person he has killed. The man is named “Vampire” in-game and claims to be an undead blood-sucker. Players can confront the vampire, who will attack them. While he can be killed with bullets, the vampire is immensely strong and is able to kill the player in one hit. Once killed, the vampire drops bat wings. Strangely, looting the vampire’s body when you don’t have enough free space bring in your satchel will bring up the notification you see when skinning an animal while having a full inventory. So, it seems whatever this thing is, it ain’t human. Another creepy group players are running into are The Nite Folk. These individuals creep and stalk around the swamps of RDR2. They have pale skin and are usually covered in blood and mud. They don’t seem to use guns, instead using knives and ambushing unsuspecting players. Many believe they might possibly be undead, though I think they are more likely just a strange gang of creepy people. Regardless, The Nite Folk make riding through the swamp at night a dangerous and scary adventure. Fans believe that a character you encounter during a side mission might actually be a time traveler. His name is Francis Sinclair. When you first arrive, the man is acting strange and using words that Arthur Morgan doesn’t understand. He wants you to find some rock carvings and explains that he is lost. After finding all the carvings, Arthur returns and finds a woman with a baby. When Arthur asks about her husband, she says he died over a year ago. His name was Tom. Her baby is named Francis, and he has red hair and the same birthmark like the adult Francis Arthur met earlier. More evidence of time travel is found in a cabin, where players can see a large mess of papers and art, which seem to show an adult Francis visiting the pyramids of Egypt. One final interesting tidbit about this potential time traveler is that his birthmark is very similar to the birthmark illustration found on the in-game Epsilon cult website in GTA V. The birthmark is supposedly a sign that a person with the mark is a descendant of Kaff, an important figure in the fake religion. Is this man the founder or a member of Epsilon? Does this connect GTA V and Red Dead Redemption 2? Red Dead Redemption 2 is filled with a lot of mysteries and odd things. This article only covers some of the more interesting finds. But players have also discovered an anaconda, a skeleton of a giant human and a mass grave of kidnapped football players. After years of fans searching for mythical creatures and ghosts, it seems Rockstar has begun to really lean into that part of the fandom. GTA V had UFOs, ghosts and aliens. And now Red Dead Redemption 2 has even more bizarre creatures and paranormal secrets for players to dig into. I’m sure fans will find even more oddities hidden out in the weird and wild West.